The Clinical Assistant includes all the functions of a Lexmark X646dte monochrome laser multifunction product (MFP) plus embedded applications to simplify healthcare workflow processes. The unique capabilities of the Clinical Assistant are easily accessed via four user-friendly icons on its intuitive eTask touchscreen interface. These icons allow clinical staff to complete complicated, time-consuming processes with a single touch, increasing productivity and giving them back valuable time to focus on quality patient care. In addition to providing time-saving workflow solutions, the Lexmark Clinical Assistant prints at speeds up to 50 pages per minute and also includes copy, scan and fax capabilities. Includes embedded applications to simplify healthcare workflow processes. Integrate directly with leading electronic medical records (EMR) solutions; use the 'Scan to EMR' icon to securely scan and route documents to pre-determined network destinations. With 'Scan to EMR', reduce turnaround time because supporting documentation for insurance claims is easily accessible. Includes an integrated 'Orders Routing' solution that allows nursing staff and clinicians to securely route physician orders and automatically separate STAT, or urgent, and normal orders with the touch of an icon. Physician 'Order Routing' works with Lexmark's Queue & View? order management solution, an optional server-based application that allows pharmacists to view and manage orders online. With 'Card Copy' solution, scan each side of the card and print both sides in an enlarged format on one side of a single sheet of paper with one touch of the icon on the Lexmark eTask interface. Quickly and easily access 'Forms' with one touch of the icon through the Lexmark eTask interface, making it easy to choose and then print selected documents. Lexmark's Embedded Solutions Framework (eSF) allows these Java-based applications to run directly on the Clinical Assistant, saving customers the expense of additional servers. *This system is not designed, marketed or sold for use as a medical device or for diagnosis. EMR systems help reduce errors because patient information is stored electronically, allowing physicians to quickly access critical information. The Clinical Assistant can integrate directly with leading EMR solutions, or the 'Scan to EMR' icon can be used to securely scan and route documents to pre-determined network destinations. Leading healthcare organizations use document imaging to complement computerized electronic medical records, providing access to more online patient information. Lexmark's Clinical Assistant can be placed at nursing stations, close to clinical staff, so that they can easily scan in time-sensitive patient updates, increasing their productivity and ensuring that critical information is entered into the patient's EMR in a timely fashion. These documents can also help reduce turnaround time for accounts receivable because supporting documentation for insurance claims is easily accessible. Improving the medication order process is a top priority in virtually every healthcare organization. 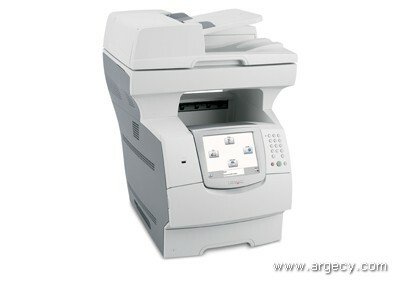 Most organizations today are in the process of adopting Computerized Provider Order Entry (CPOE); however, for organizations that have not fully implemented CPOE or need a CPOE backup system, fax machines are still commonly used to send handwritten physician's orders to the pharmacy or a lab for processing. This process breaks down easily leading to lost or delayed orders. The Clinical Assistant includes an integrated 'Orders Routing' solution that allows nursing staff and clinicians to securely route physician orders and automatically separate STAT, or urgent, and normal orders with the touch of an icon. The Clinical Assistant also integrates with leading medication order management systems and works with Lexmark's Queue & View? order management solution, an optional server-based application that allows pharmacists to view and manage orders online. Lexmark's Queue & View? solution is driven by patient barcodes and accessed via secure Web browsers to streamline processes and helps to meet Joint Commission on Accreditation of Healthcare Organizations and Health Insurance Portability and Accountability Act mandates for patient safety and privacy. Patient insurance or identification cards are copied frequently and included with patient files. However, because the cards are typically two-sided, medical staff must go through an extra step and make two separate photocopies - one of both the front and the back of the card. Lexmark's solution allows staff to scan each side of the card and print both sides in an enlarged format on one side of a single sheet of paper. The 'Card Copy' function is easily accessed with one touch of an icon on the Lexmark eTask interface on the Clinical Assistant, saving time, as well as paper, and making a frequently used process much more efficient. Many healthcare facilities are moving away from expensive pre-printed forms and storing frequently accessed documents online for printing on demand. This approach saves money and avoids compliance issues associated with using outdated forms. However, clinical staff do not have time to perform the extra steps required to log in to a workstation, locate the document via Web browser and submit a print job. Lexmark's solution allows clinical staff to quickly and easily access those 'Forms' with the touch of an icon through the Lexmark eTask interface on the Clinical Assistant, making it easy to choose and then print selected documents. This solution provides the benefits of online access, without the hassle of the extra steps required to locate and print frequently used documents from an online repository. Supplies: Functions only with replacement cartridges designed for use in the United States and Canada .